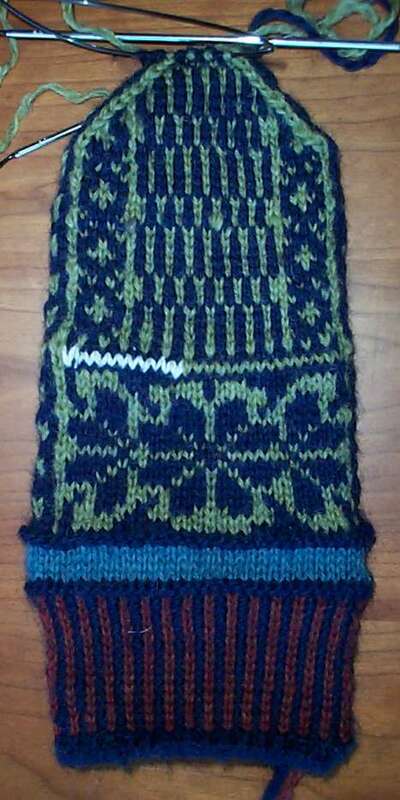 This Norwegian mitten thing is entirely too addictive to stop. And who says that lefts and rights have to be identical? 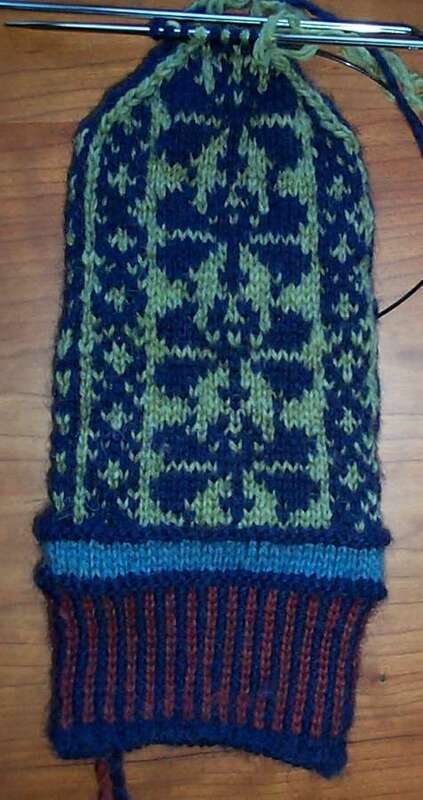 I’m just about done with the body of Mitten #1, and am about to start the thumb. My mittens are about 8 inches around, and 9 inches from the bottom of the cuff to the tip of the fingers. My gauge is approximately 8 stitches and 9 rows per inch. I can wear them – just barely. They’re a bit tight. I’ll probably give this pair to someone with slightly smaller paws – probably to someone who wears a women’s size medium glove. If I were knitting another pair for myself, I’d graph up something that has about eight stitches wider around total, and about six rows longer. Again, totally untested and untried. The motifs on #2 are inspired by (but not directly taken from) the group of 16th century charted designs in The New Carolingian Modelbook. Cautions are therefore given against using this chart before I make a final version. One observation on the mitten template provided by Hello Yarn: it appears to use \ to mean one ssk decrease or // to mean one k2tog – not two. I’m not sure if I’ll use the same notation in my final chart because it’s confusing. Finally, on the Modelbook – I’m thinking of investigating coming out with a new edition via one of the self-publishing/publish on demand services. 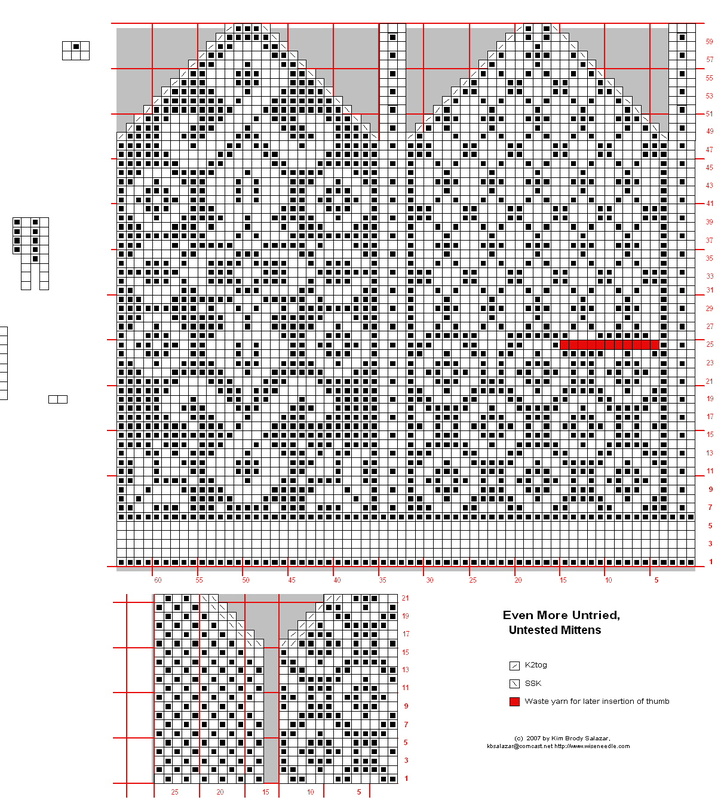 The book divides evenly into square unit graphed patterns useful for knitting, crochet, and embroidery, and line unit patterns, mostly of use to stitchers but not knitters. I have a feeling there is far more demand for the former than the latter, and am considering issuing the two parts separately. Any feedback on this idea? Go for it!! I have your book and have stitched things from it. When I get better at color work I will try using the patterns in knitting. I have been thinking about mittens lately, myself.